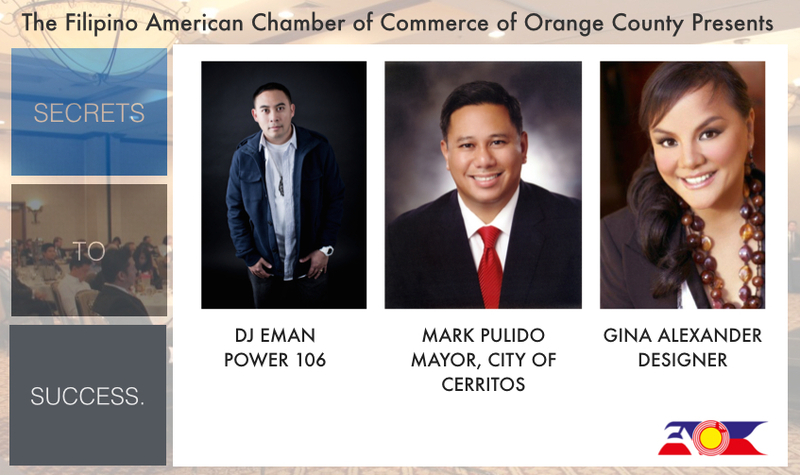 FACCOC is setting it’s sights on their 6th Annual “Secrets to Success” event where guest speakers will detail their journeys toward achievement and have an interactive Q&A with attendees. Pre-Register for $10 before April 1st! Mayor Mark E. Pulido was elected to the Cerritos City Council in March 2011. A proud Cerritos resident since 1972, Mayor Pulido has an extensive history of local community service and professional work experience in local, state and federal government. He was elected to the ABC Unified School District Board in 2001 and was re-elected in 2005 and 2009. He served as Board President in 2007-2008 and concluded his service in March 2011. Mayor Pulido also served as the Board Liaison for the ABC Federal Head Start and State Preschool programs for seven years. In 2009, the Los Angeles County Office of Education honored Pulido with its “Board Member of the Year” award. In 2013, Governor Edmund G. Brown Jr. appointed Pulido to serve on the CaliforniaVolunteers Commission. Mayor Pulido serves on the City’s ABC Unified School District, Parks and Recreation, Performing Arts, Personnel and County Health Department/Health Insurance Committees. Mayor Pulido is the Council’s delegate to the California Contract Cities Association and the Gateway Cities Council of Governments – 91/605 Corridor Cities Committee. He is the third alternate to the Sanitation Districts 2, 3, 18/Waste Management and Sanitation District 19/Waste Management. Mayor Pulido is the District Director for Congressman Alan Lowenthal. He previously worked for the California Legislature for more than a decade, serving as District Director to State Senator Alan Lowenthal. Prior to that, he served as a legislative consultant with the California State Assembly in the Los Angeles offices of Assembly Speakers Robert M. Hertzberg, Herb J. Wesson Jr. and Fabian Núñez. In the 1990s, Mayor Pulido worked for the City of Long Beach in the City Manager’s Office, the Long Beach Redevelopment Agency, the Budget Bureau, the Parks, Recreation and Marine Department and the Gang Intervention/Prevention Program. Mayor Pulido received his bachelor’s degree in History and Asian American Studies from the University of California, Los Angeles, where he served as UCLA Student Body President. He received his Master of Public Policy degree from The University of Chicago as a Woodrow Wilson National Fellow. Pulido and his wife Gloria have two children. A picture-of a lover, a friend, a child, a pet, your husband, wife, mother or father. An image of the whole family, or somebody who is gone but not forgotten. A reunion, anniversary, birthday, a great moment at the office! These fond portraits are the hallmark of handbags and accessories by GINA ALEXANDER. This L.A.-based designer has created a line of handbags and other kinds of accessories that allow the customer to design these unique pieces with their personal photos, mementos that travel with you each day, reminding you of the people, places and things you love! A GINA ALEXANDER Photo Bag is a lot of fun and an absolutely necessary accessory. With Christmas coming, the options are endless! GINA ALEXANDER runs her business with the help of her husband Richard who oversees the various lines available through the company: Handbags, Men’s, Baby, and more. Most recently, via a licensing deal with Janie Hendrix (the sister of Jimi Hendrix), GINA ALEXANDER has created a line of Jimi Hendrix photo bags (both leather and fabric) and limited-edition, numbered leather jackets with rarely-before-seen images of the musician taken onstage at concerts like Winterland in 1968, Waikiki in 1969 and Arco – Sacramento in 1970 by well-known rock photographer Robert M. Knight. This new Collection, just recently introduced, has already garnered the attention of fine stores such as Incognito- Michigan, Polite Society-Seattle and Gerard Marti Galleries-Maui, which will carry these distinctive accessories. Every GINA ALEXANDER Photo Bag, and all her accessories, is made from the finest materials, hand-crafted, beautiful and lasting. Gorgeous on their own, the bags are even more dear when decorated with your own personal touch, your MIP-Most-Important Photo. GINA ALEXANDER is a fashion veteran, having studied in Europe, apprenticing with LA-based fashion houses, and finally, opening her own kiosks stores at the Hollywood & Highland Retail complex and The Grove. Now, with a growing company, ALEXANDER’s Photo Bags have been sold through Nordstrom, ICE Accessories and Saks Inc. department stores and can currently be found on partnered retail locations such as ebags.com, 40+ boutiques nationwide and over 600 professional photography studios worldwide. A recent appearance of GINA with her Photo Bags on the Home Shopping Network, (available in 87 million homes) was a huge success, selling out in record time. A great panel so far. I’m excited to be there, listen, learn, and interact with the dynamic individuals and friends. Can’t wait to meet everyone and find out their needs in business, I know sales and marketing is one of the most needed skill to scale your business. Also can’t wait to see Eman he came to one our fundraisers and he is definitely an influence in the world of musci – great to reconnect with him ! Thanks FACOC Orange County for your belief in what what I do and why I do it ! thank you for taking action for me to speak and great follow up ! Glad to help other Kababayans ! it’s our year to build more and more millionaires in our community.